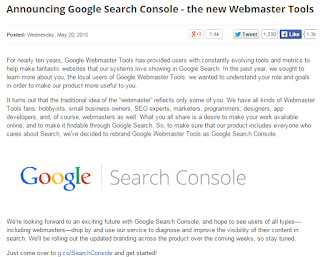 Michael Fink who is product manager of Google Search Console is announcing in their recent blog of 20-May-2015 they had changed the name of Google Webmaster tools. 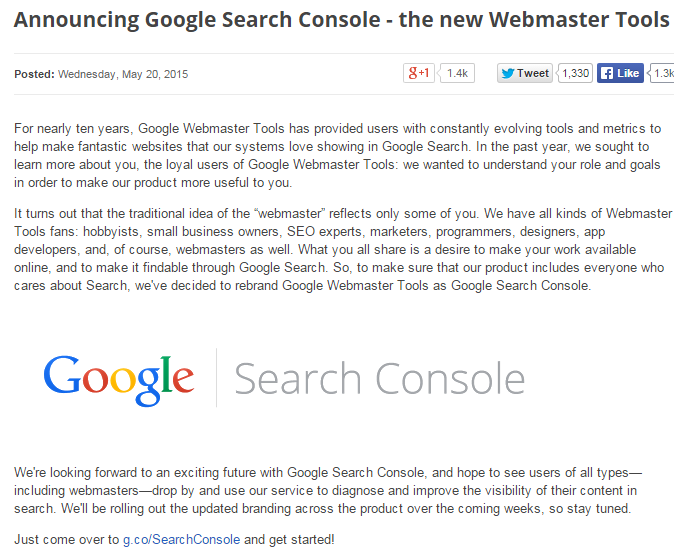 The new name is Google Search Console right now there is nothing change in functions of this tool except name. On other side John Muller is also sharing his thoughts via Google+ he is remembering those old days when Google Webmaster Tools first launched for the submit sitemaps files. John Muller is giving appreciation to their team to do this all work, because they had done worked on that almost over the year after many experiments because it was a difficult task to do but they done it in right directions. As you can see now-a-days who is involve in online marketing he/she is using Google Search Console to see performance of their website in Google Search Engine. No doubts that this is awesome tool to tell you almost each and every thing about website. Guidelines For Newbie: There are numbers of people who wants to make their career in online marketing and when they will follow the guidelines of Google from Google Search Console they will definitely learn many things. This tool will tell you errors about your website like which kinds of back-links you have. One more thing is very interesting about Google Search Console a person from Google will send you a mail if your website have Manual Penalty. You can remove manual penalty much easier than Google algorithmic penalty with the guidelines of Google web spam control team’s executive. Sitemap: You can submit and check the status of Sitemap. Crawling: If your website is not cache then you can use this tool to crawl your site in Google, beside that you can set the crawl rate as well for every of your website. Robots.txt: This file will stop Google spider to crawl those all webpages of your website which you don’t want to show to your visitors and readers. Link Factor: Now-a-days back link factor have their own importance in earlier life of seo you can create any kind of back link to rank your website top in Google. Now the scenario has been totally changed Google will give more authority to only those websites which will have high quality back links. You can check the status of back links of website and if you think some links are proving harmful for your site then you can use the Search Traffic tab’s Link to your site section. Disavow List: This is good thing by Google only those persons can send their disavow list file who have access of Google Search Console account. This option is great from security point of view because no one do these all above factors till they will haven’t access of account. If you are operating Google Search Console tool by your own then it’s ok but if any other person is using this tool on your behalf then you should check it out each and every thing time to time. Domain Preference: Now it is in your hand how you would like to show your domain in Google search engine in this section you can set a preferred domain for example with www or without www. Conclusion: The conclusion is that only Google webmaster tools name changed to Google Search Console and still each and every option is remain same to use. I would like to know from your end which name is best for this tool (Either Google Webmaster Tools or Google Search Console). From my opinion Google Search Console tool name is looking some technical but on other hand Google Webmaster tools name is looking perfect for this might be my choice so these why I would like to hear from you.